Yesterday Howard and I went to Papa Jake's where the most hilarious thing happened. Note to out-of-towners: Papa Jake's is a tavern on the edge of town where Buffalo borders Black Rock. We are sitting outside on the patio which, Papa Jake's patio is anything but bucolic. There are sirens, muffler-less wrecks, boom cars, you name it. Some guys from a softball team are also on the patio, drinking beer. All you can hear is the "F" bomb. These girls came out and were sitting with the guys. Then one of them turns to Howard. "Were you at the softball game?" she asks. Note to out-of-towners: It is business as usual to talk to strangers on the patio of Papa Jake's. It is almost a guarantee that you will be addressed at some point by someone at another table. Sometimes they will even help themselves to your food! We have had that experience. Anyway, Howard said no, he had not been at the softball game. "Oh," the girl said. "I was just thinking you were. 'Cause someone else there was wearing the same shirt you have on." Now, I am dying, hearing this. 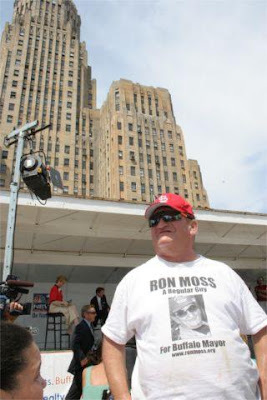 Because Howard as you can see in the picture above was wearing his "Ron Moss For Mayor" T-shirt. Ron Moss is his cousin as I have explained from time to time. About four years ago he ran for mayor. And we had these shirts made up. Here is a picture of Moss wearing one of the shirts on the campaign trail. But, I mean, we only had maybe three of them made. And this girl saw one of them at the softball game! She sounded completely certain and there is no mistaking that shirt. So someone there must have been wearing one. But the greatest thing about it was what Howard did. He shrugged and turned back to his food. What are the odds of a stranger recognizing the Ron Moss shirt and saying she just saw one? It is like the time I went to Tonawanda and those people were playing that record of Leonard Pennario's. Wow, that gave me a shiver. If you click on his name you will hear the waltz he was playing. But this woman who saw the Ron Moss shirt, Howard just blows her off. It is unbelievable, how he handled that! Then he just goes back to eating as if nothing had happened. He does not even say anything to me! "Howard," I whispered, "I can't believe someone else was wearing a Moss shirt!" "Well," he said, "he has a lot of supporters." I do not know how he does it. Talking to strangers: A friend of mine worked for an older man back in the 1960s. Usually, they'd go to some diner for lunch. If the stools and booths were occupied, the old man would take his food, slide into a booth next to the other couple, and schmooze with them. He was a Southerner, convivial, and lived through the Depression, when personal space was at a premium and people didn't just blow each other off. My friend never got used to it; he was always uncomfortable and embarrassed. Howard really looks great in that picture! Second only to that amazing looking sandwich. It has been too many years since I have eaten anything that looked that good. And anyway, it might have been Howard that 'has a lot of supporters'. (2+2, ya know) Um hum. Yes, let's have more shots of Howard eating.